I was more than tired of seeing the ‘configuration errors detected' on my Contact 7 contact form. It didn't matter what I did to try and fix the errors, I still got the notification. Granted, the form actually worked, but the error notice bugged me. So, I decided to find a new plugin and the WPForms Contact Form came up second in the search results. You'll notice that although the top two plugins both show 1+ million active installations, Contact Form 7 only rates 4 stars with 1,564 ratings, while the WPForms plugin has a 5-star rating with 3,422 ratings. 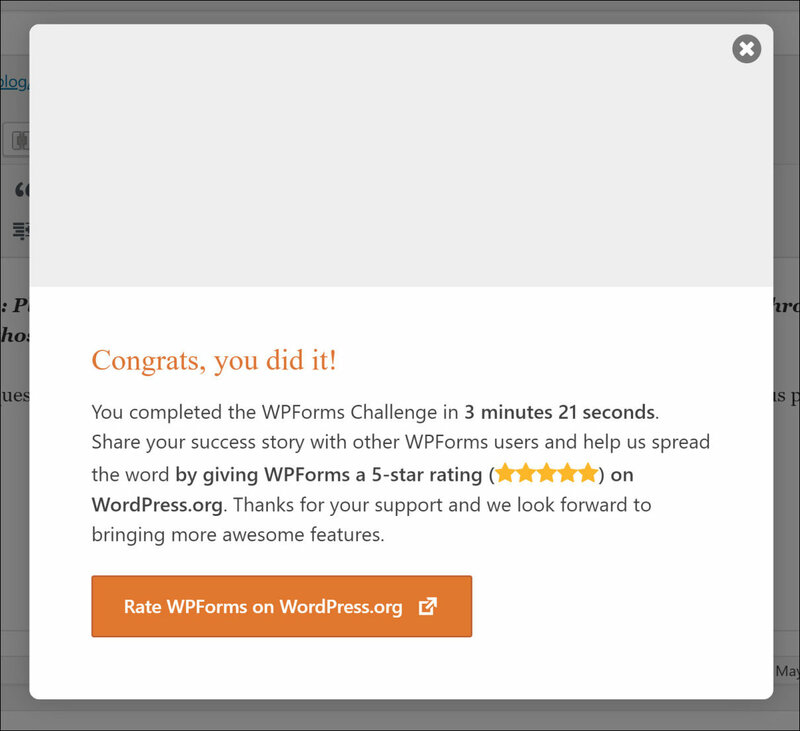 After installing and activating the WPForms plugin, I scrolled down the page and saw the WPForms Challenge. It promised that I could get the first form created in under 5 minutes. The first step was to name the form. After calling it “Contact Us”, I hit the ‘Done' button. The next step was to select a Template. I chose the Simple Contact Form. It then gave me the option to add additional fields to my form, which I didn't need, so I clicked ‘Done' really quickly during that step. 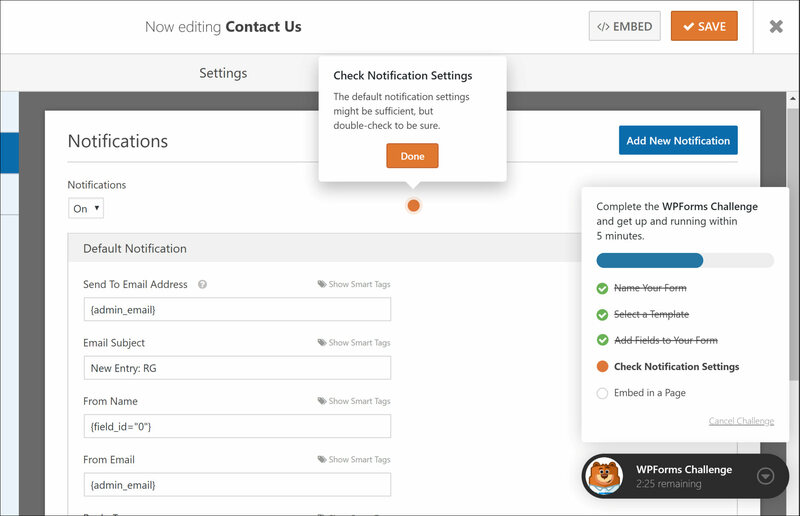 The notification settings were already correctly installed in the form and all I entered was the Email Subject line – New Entry RG, to indicate that the email was from this blog, RosalindGardner.com. To embed the form, the plugin opened my existing Contact page, where I clicked on ‘Add Form', selected the ‘Contact Us' form and then ‘Add Form'. The screenshot shows that the process took me 3 minutes and 21 seconds. In reality, I had a working form installed in just over a minute. Creating all the screenshots on this page is what took the bulk of my time. Anyway, if you're looking for a nice, easy to install contact form, look no farther than WPForms. Good review and walk through…. I have been using GravityForms for a while and sometimes it seems like you need a Phd in configuring things to get through some of these plugins. 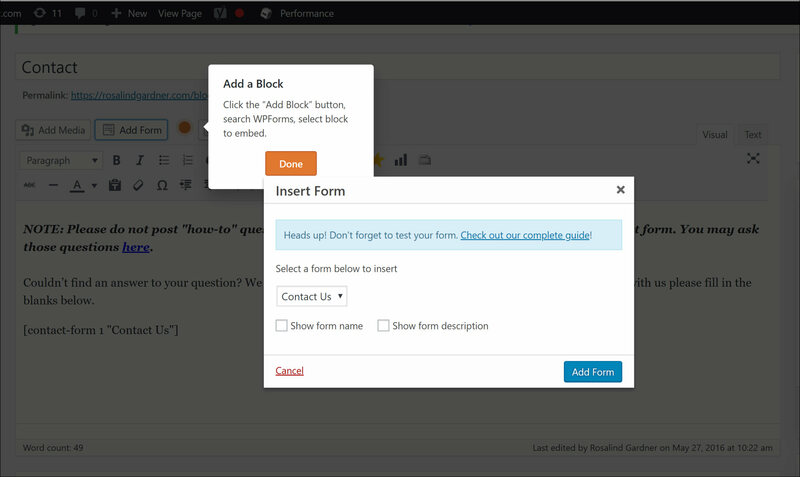 How does WPForms stack up? The interface seems easy to use, but what is your experience? Where are the results stored? Is there a list in the backend or does it email you all the info once the form is submitted? I hate plugins that require a Phd (in php), so you can be assured that WPForms is super simple and the info gets sent to you as soon as the form is submitted. WPForms looks OK and I will have a go with it. Clicked on SAH with Firefox and got “Hmm. We’re having trouble finding that site.” and Google Chrome “This site can’t be reached” even though you have https on both. As a matter of interest do you use all the pluguns you mention. Thanks for letting me know about the links. I’ll check that out! If I write about a plugin, I’m more than likely using it at the time. But with all the changes that occur, some plugins mentioned in older posts may no longer be in operation on this blog. Guess I’ll have to write an updated version of ‘WordPress Plugins and How I Use Them‘.